Charles William John Frost was born on the 31st of May 1895 in Dorking Surrey and was baptized on the 3rd of August 1895 at St Martin’s church in Dorking Surrey. At the time of the baptism Charles’ parents lived at 16 Jubilee Terrace Dorking Surrey and Charles’ dad was working as a labourer. Charles’ father was called John Frost and was born in the 4th quarter of 1864 in Rusper Sussex and was baptized on the 28th of December 1864 in Rusper Sussex. Rusper is a small village in the parish of Horsham. John’s parents and Charles’ grandparents were called Morris and Sarah Frost. Charles’ mother was called Emily Frost nee Elms and was born in the 3th quarter of 1870 in Dorking Surrey and she was baptized on the 7th August of 1870 in Dorking Surrey. Emily’s parents and Charles’ grandparents were called David and Mary Ann Elms. John and Emily married on the 9th of April 1890 at St Martin’s church in Dorking Surrey. At the time of the marriage, John was working as a plate layer (trackman) and lived at North Street Dorking Surrey. John’s dad was working as a labourer. Emily lived at Ebenezer Row Dorking Surrey and her father David was working as a bricklayer. Charles had 5 siblings of whom two died as infants. Emily Annie Frost was born on the 4th of May 1890 in Dorking Surrey and was baptized on the 9th of July 1890 in Dorking Surrey. She died in the 4th quarter of 1890. She was not yet one year old. John Frost was born in the 2nd quarter of 1891 in Dorking Surrey and also died in the 2nd quarter of 1891 in Dorking Surrey. Three of Charles’ siblings who survived infancy were: Lily May Frost born on the 6th of May 1892 in Dorking Surrey and baptized on the 15th of June 1892 in Dorking Surrey; Albert Edward Frost born on the 17th of November 1897 in Dorking Surrey and baptized on the 16th of February 1898 in Dorking Surrey and lastly Violet Frost who was born in the 3rd quarter of 1901 in Dorking Surrey. 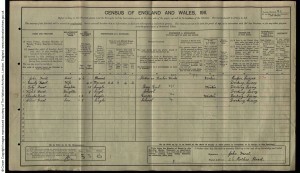 1891 Census reads that the family lived at Ebenezer Row in Dorking Surrey and John was working as a general labourer. Admission Book of 1900 reads that Charles was admitted together with his sister Lily to the Dorking British School on the 12th of March 1900. They lived at 16 Jubilee Terrace in Dorking Surrey. 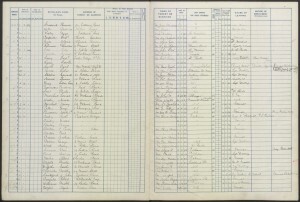 Charles left the school on the 26th of November 1900. 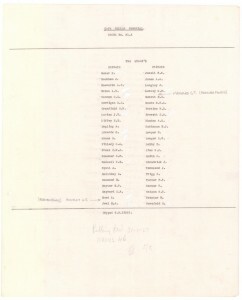 His schoolmate was Charles Upfold of 28 Orchard Road Dorking Surrey. 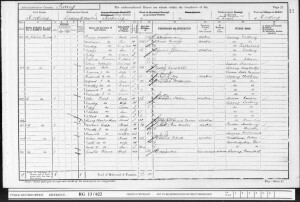 1901 Census reads that the family moved to 16 Jubilee Terrace in Dorking Surrey. Charles’ father worked as a furnace stoker. Admission Book of 1902 reads that Charles was admitted to the St Martin’s Church of England School in Dorking Surrey for infants on the 28th of January 1900. He still lived at 16 Jubilee Terrace in Dorking. On the 20th of April 1903 Charles was ‘transferred to boys’. 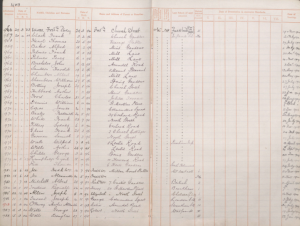 Admission Book of 1903 reads that Charles was admitted to the St Martin’s Church of England School in Dorking Surrey for boys on the 20th of April 1903. 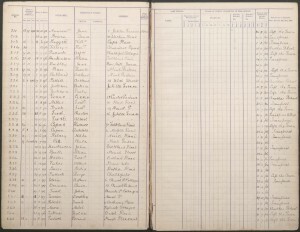 Charles left the school on the 28th of May 1909. His schoolmate was Sydney/Sidney Fillery of 6 Orchard Road. 1911 Census reads that the family lived at 26 Rothes Road in Dorking Surrey. The house had seven rooms. Charles’ dad worked as a stoker in timber works, Charles himself as a grocer and his sister Lily May as a day girl. A day girl could be either a daily servant – a non-residential general servant or a brick factory girl that does various minor unskilled jobs in brick-yards. Charles was part of the 2/4th Battalion Queen’s Royal West Surrey Regiment of the Territorial Force. At the time of enlistment Charles resided in Dorking, likely with his mother, at 43 Rothes Road. Charles also enlisted in Dorking. He was a private and his regimental number was T/3536. Charles died on the 9th of August 1915 at Gallipoli in the Balkan Theatre of War. Charles was killed in action on the same day with the same regiment as Sidney Fillery, his schoolmate, sometime after disembarking at Sulva Bay in Turkey. Charles was 19 years old. He is commemorated at Helles Memorial on panels 30 and 31 and also at the Dorking St Martin’s church memorial; next to Sidney on both. Charles’ body was also never found. 2/4 Battalion of the Queens (Royal West Surrey Regiment) was part of the British Territorial Force. The Battalion was formed in Croydon in August 1914 and then moved to Windsor to join the 2/ Surrey Brigade, 2/ Home Counties Division. On the 24th of April 1915 the Battalion moved to Cambridge as the part of 160th Brigade, 53rd Division. In July 1915 the Battalion mobilized for war and embarked to Gallipoli from Devonport in Plymouth. From the 9th of August they took part in various actions against the Turkish Army and after huge losses (the division was reduced to 15% of their full strength) due to combat casualties, disease and bad weather the Battalion was evacuated to Egypt on the 19th of December 1915. 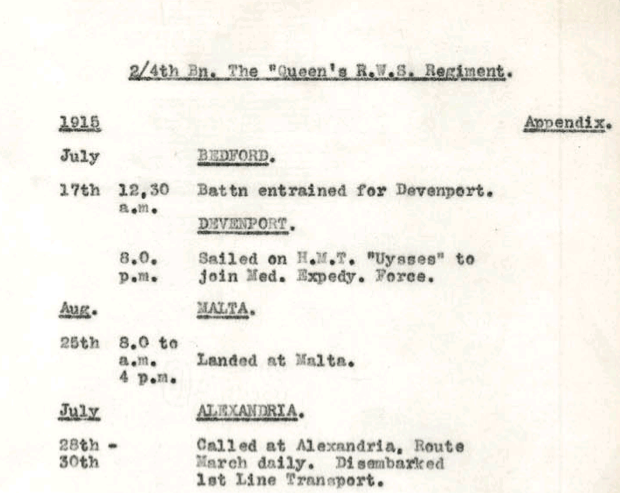 On the 17th of July 1915 at 12.30 AM the Battalion boarded trains in Bedford for Devonport. At 8.00 PM on the same day the Battalion sailed on the HMT U[l]ysses to join the Mediterranean Expeditionary Force in Gallipoli. On July 28th the ship docked in Alexandria, Egypt. 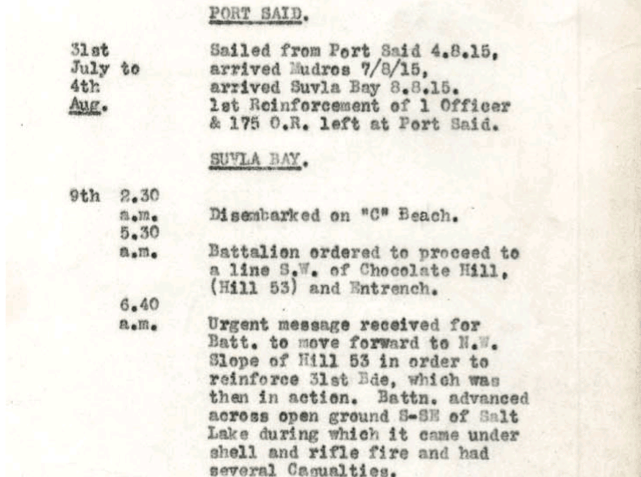 From the 31st of July to the 4th of August the Battalion called at Port Said. Then they sailed to Mudros Harbour at which they arrived on the 7th of August 1915. On the 8th of August 1915 the ship reached Suvla Bay on Gallipoli peninsula. The next day on the 9th of August 1915 at 2.30 AM, the soldiers left the ship on ‘C’ Beach. Sometime during this day, Private Frost died. At 5.30 AM the Battalion was ordered to entrench south west of Chocolate Hill (Hill 53). At 6.40 AM an urgent message sent them to the North West slope of Hill 53 to reinforce the 31th Brigade. At this time the Battalion suffered several casualties (shelling & rifle firing) while advancing across South-Southeast of Salt Lake. At 7.30 AM they arrived at Chocolate Hill and were ordered to join the 33th Brigade and advance round North spur of the Hill & thence East to support the Brigade which was under attack. 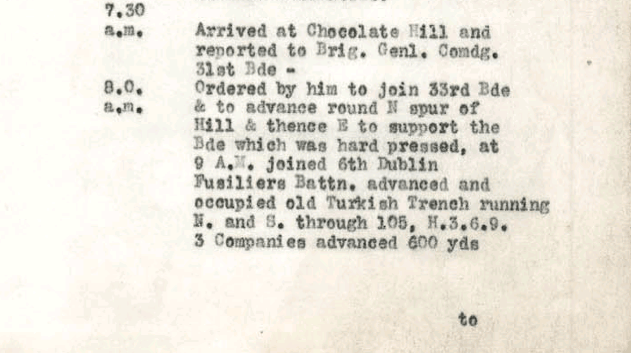 A 9.00 AM the 2/4th joined the 6th Dublin Fusilier Battalion and advanced and occupied an old Turkish trench. 3 companies advanced at 7.30 AM by 600 yards to front on to Hill 70 (Scimitar Hill) but were driven back by their own shell fire in the rear. 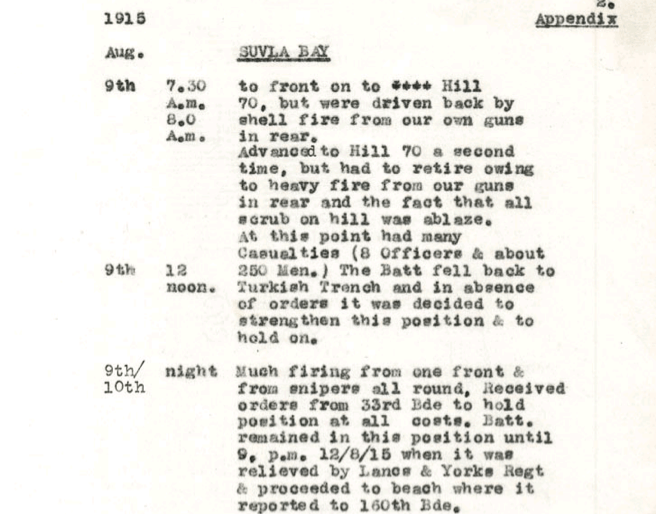 The second attempt to advance to Hill 70 took place at 8 AM and also failed due to heavy fire from own guns in rear and ablaze scrubs on the Hill. At this point the Battalion suffered heavy casualties (250 men). At 12 noon the Battalion retreated back to the Turkish Trench and held on there. 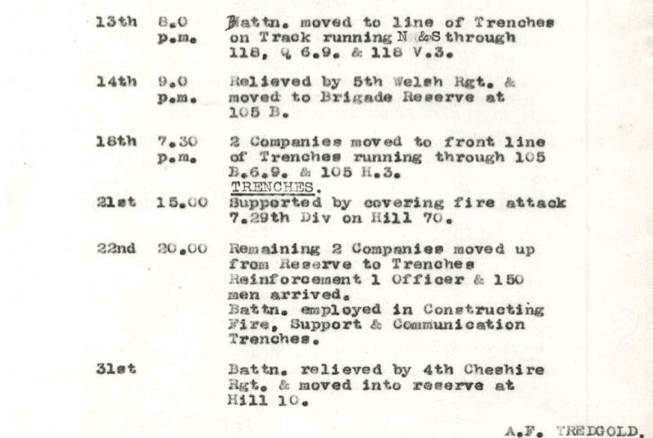 During the night of the 9th to 10th August the Battalion was under the heavy fire from one front and snipers while receiving an order to hold the position at all costs…. It is likely that Private Frost and Private Fillery both died during the second advance on Hill 70 at 8 AM.